This issue features photographs by Hullabaloo staff photographer Ron Scott. Featured are images selected from over 400 rolls of film exposed during his tenure at the Tulane student newspaper from 1964 through 1967. 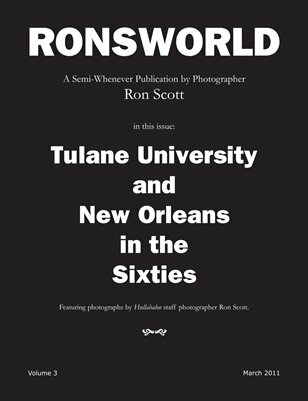 Ron photographed almost everything that went on at Tulane. Subjects include student activities, campus life and architecture, fraternity parties, civil rights sit-ins, theater productions, hurricanes, sports, Vietnam War protests, celebrities, Newcomb coeds and more.